Can the Tide of History be turned back? This entry was posted on April 1, 2013 by Tintean Editorial Team/fdg, in Book review, History. Bookmark the permalink. 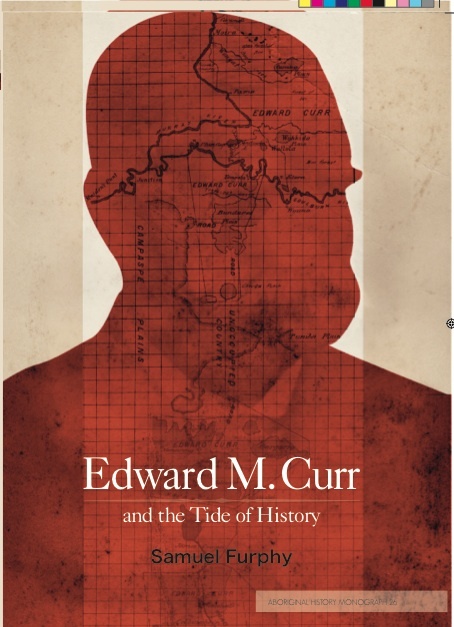 Samuel Furphy: Edward M. Curr and the Tide of History. Canberra: ANU E Press, 2013. Samuel Furphy, great grand nephew of Joseph Furphy, shares his famous ancestor’s sharp eye, writerly elegance, and passion for social justice. However, he’s much better at judging his readership, and this is a highly readable and important biography (not that Joe isn’t readable, but Such is Life makes more demands than most modern readers can easily accommodate). Sam Furphy’s book is history with urgent resonances for the present. In 2002, the Yorta Yorta lost their land-rights claim to areas along the Murray. This biography is the prequel to that narrative. Might good historiography serve to re-open the Yorta Yorta land-claim? Their remaining hope possibly lies in this meticulously researched and superbly well written history. Edward M Curr (1820- 1889) has weak claims on Irish-Australia, but important ramifications for contemporary Indigenous culture. He was from an English Catholic family, educated at Stonyhurst and Douai by the Jesuits, and he married an Irish woman from Kildare. He was interestingly different from most of his pastoral, land-owning class by virtue of his Catholicism. It rarely told against him, or his father. His education meant that he passed as an educated gentleman, and he was a bit of a poet (though bilingual jingles were more his go). He valued his library and his fireside chats with his family about books. He was above all, a man who had a compulsion to write and who did it well, littering his texts about breeding better horses with classical allusions and reference to Don Quixote. Reading the biography, I was struck by the depth and range of his learning, and by how well Joe Furphy and he might have got on at the level of book-loving conversationalists, except for their class and politics. Religion would not have been a bar to friendship, though Joe’s passionate socialism and progressive thinking on many issues would have been. Curr belonged to the landed gentry that travelled to and fro between Europe and Australia in the nineteenth century. He did the grand tour in 1852, taking in Spain, France, Italy, Greece, Turkey, the Levant including Palestine, Egypt, before returning to Ireland, England and France. It appears to have been literature-driven. He was so entranced by Washington Irving’s revelatory tales of the Alhambra (Granada, Spain) that he employed the same guide (20 years had elapsed since Irving used him) to inspect it. Serious money and serious leisure was to be bought in Australia in the nineteenth century, if you could get your hands on land. His father had made a bloody start establishing his empire in northern Tasmania. Edward Curr the younger learned from this. When he set up a series of properties between Melbourne and the Murray, he was more appeasing in his relationships with Aborigines, making an effort to learn the language, but his was a very paternalistic kind of relationship with the Bangerang (Yorta Yorta), formed during his occupancy of properties along the Murray and Goulburn Rivers. Later he would go on to become an amateur ethnologist and ethnographer, and even sit on the Victorian Board for the Protection of Aborigines , and in these roles, he espoused the very common (and convenient) view in the nineteenth century that the Aboriginal population was doomed to extinction. In his personal dealings with Aborigines, though, he was a benign paternalist, regarding them as childlike and even ‘lunatic’ as a race, and he resisted the notion that they needed education. He was firmly behind the move to expel the semi-educated and politically proactive community from Coranderrk (near Healesville). Before joining the public service and serving on the Board, Curr lost a fortune in properties (with the help of his brothers), through Victoria, Queensland and New South Wales, and became the highest paid public servant in Victoria, as Chief Inspector of Stock, with responsibilities for keeping foot-and-mouth disease out of Victoria, and also for clearing up scab in sheep. He was remarkably successful at this, hence his salary, a staggering £750 per annum. This lifestyle as a senior bureaucrat gave him even more leisure for books and writing, which further increased his prestige as a gentleman scholar and practical man of the land. He published several major works: one on breeding horses, as well as several memoirs of the squatter class (the most important being Recollections of Squatting in Victoria, then called the Port Phillip District 1841-1851, 1883), many reports, as well as a monumental 4-volume work, The Australian Race: Its Origin, Languages, Customs, Place of Landing in Australia, and the Routes by It Spread Itself over That Continent, 1886. Furphy’s book is highly crafted in order to make its historiography lucid and compelling. We get a full account of Curr’s careers, and how and precisely why they shaped his views. His early career as a pastoralist fed into his work as bureaucrat with responsibilities for livestock, and the common thread of his reading all fed the writing. He is able to take delight in Curr’s linguistic pizzaz, and suggests that perhaps the writing was an end in itself for Curr, that it enabled him to indulge his avocation as a gentleman litterateur, and reading recently some of what could be thought of as a handbook for farmers, Pure Saddle Horses and How to Breed Them in Australia…. (1863), one cannot help be struck by his flamboyance and joie de vivre as a manipulator of language. A pity, perhaps, he did not turn his hand to fiction. As a pastoralist, he got to know the language of the Bangerang. This led to subsequent research, mainly but not exclusively in the field of comparative philology, in which he compared lexical items in order to build a theory about diffusion of Aboriginal groups in Australia, and about where they originated. All such research is thoroughly discredited now, because the timeframe of the arrival of Aboriginal peoples on this continent has been pushed back by thousands of years. We get too from Sam Furphy a very lucid account of Curr’s ethnological ideas and where they are located within a complex nineteenth century history of ideas about race, and how his fortunes as an ethnographer have waned and waxed since his death. Curr’s writings as an amateur ethnologist and ethnographer were what sank the Yorta Yorta claim, one hundred years after his death. Legally, Justice Howard Olney found that customs described by Curr had not been maintained by the increasingly westernised Indigenous people of the Murray. Apparently, in law, the fact that they no longer waste fish stock caught was a tipping point. Furphy argues that Olney took Curr’s evidence at face value, as transparent and not itself questionable because of Curr’s vested interests and intellectual biases, and did not subject it to sufficient critical scrutiny. That gap has been closed in this fine biography. Samuel Furphy’s work, hopefully, lays the groundwork for using intelligent history to query the validity of Justice Olney’s findings against the Yorta Yorta in 2002. Can the tide of history be turned back by careful historiography? Frances has spent much of her academic career annotating and analysing Joseph Furphy’s novels, and in the last decade has worked with Yanyuwa people (Gulf of Carpentaria, Northern Territory), whose landrights claims were successfully heard by Justice Olney, though the land has yet to be returned to the people.